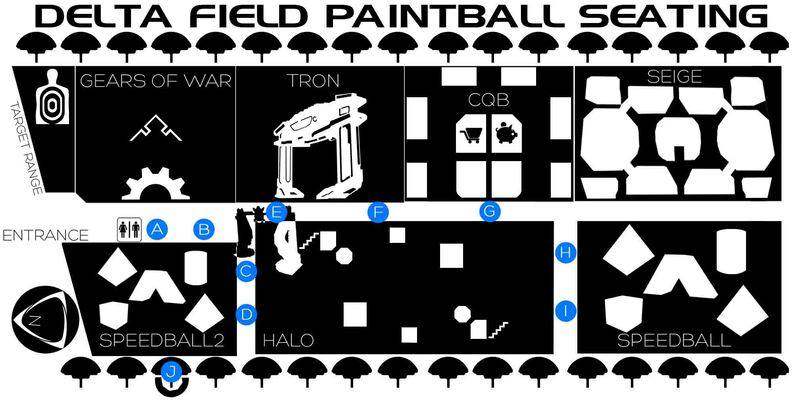 All players must begin the game at their flag station (or assigned starting point) and cannot leave that area until the game begins. Players who are marked are eliminated out of the game. If a player is eliminated while they are carrying the flag, they must drop the flag where they were hit, or hang it on the nearest available object. (Not another player). Players who are eliminated may not, by word or gesture, indicate any intentions or locations of the opposing team members. When a player is carrying the flag, it must remain visible at all times and must be carried in the hand or over the arm. Success: Capture the opposing team’s flag and return it to your base. Insider Information: The basic idea is to capture the flag. If you can avoid mixing it up with the other team, do so. Also, if you do capture the flag, leave a couple of your players behind to slow down the opposition in case they are on THEIR way back with YOUR flag. You don’t need to leave half of your team back to defend your flag. Only a couple of people are needed because the idea is not to stop the opposition from getting your flag, the idea is to slow them down and buy some time for the attackers. Besides, the more attackers you have the better it will be for you when you reach the opposition’s flag station. Remember, there’s safety in numbers. Two Teams must try to eliminate the other team’s Manager. The Manager cannot undo their tether. Players who are marked are eliminated from the game. If playing the tethered Marker variation, the Manager can abandon their Marker, but cannot use another Marker. If you use the limited paint option, players cannot share paintballs. Success: Eliminate the opposing team’s Manager. Insider Information: Assign an appropriate number of players to guard the Manager at the flag station. If playing the tethered Marker variation, this group must stay with the Manager at all times. Another tactic is to have the whole team stay back to defend and wait for the other team. No matter how long it takes, wait for them to show up. They may be trying the same thing. The team with the most patience will usually win this one. This is Capture the Flag, but with a twist. A simple tag from your teammate brings you back into the game if you’ve been eliminated. When a player is marked, they call themselves out and lay or sit on the ground (using common sense). The player then places their barrel sock on their Marker to indicate that they have been hit. They cannot move from this location until tagged. This is referred to as Waiting. Players who are waiting cannot shoot or disclose the positions or intentions of opposing players. If an opposing player tags a Waiting player, they are out of the game. If a Waiting player feels that no one will find them, they are tired of waiting, they can take themselves out of the game. In this case the player cannot be tagged back into the game. There is no limit to how many times a player can be tagged back into the game. Players waiting to be tagged cannot shoot or be shot at. Players who are eliminated may not, by word or gesture, indicate any intentions or locations of the opposing team member, until they are tagged back into the game. Insider Information: This game makes heroes out of a lot of players. Knowing you can get back into the game makes some players a little braver. My favorite trick is to wait until someone is in the open, shoot him or her, and then wait for his or her team members to tag him or her back into the game. One team must get a “hostage” away from the other team and bring them back unharmed. Captors are given a five-minute head start to take the Hostage to one of the Hostage Holding Areas. A start of Game Signal is given to let Captors know when the game has begun. Captors cannot move the Hostage out of the Hostage Holding Area. The Hostage cannot attempt escape. If the Hostage is marked, the team that marked them looses. The Hostage must have at least one Rescuer with them when they reach Sanctuary for the Rescuers to win. If the Hostage finds them alone for some reason, after being rescued, they must stay where they are and wait for the Rescuers to find them again. They may call out for help if they wish. Players who are marked are out of the game. Success: Captors: Stop the Rescuers from bringing Hostage to Sanctuary. Rescuers: Bring Hostage to Sanctuary. Insider Information: A living objective instead of a flag changes a lot of things. Flags don’t talk back, flags don’t want to stop and take a rest, and flags don’t hind behind you shouting “Get him. Not him. HIM! You moron!” You must protect the Hostage at all costs. When he/she is in the custody of the opposing team you must also be careful because if you mark them YOU lose the game. Those players protecting the hostage should therefore stay real close to them; the opposition may not want to risk shooting at you if they think they might hit the Hostage. Groups of five go into the field and work it out in this elimination only game. Teams will stay in their starting points until the Start of Game Signal. The team gets a point for each elimination it inflicts on the other team. There are no points for surviving members of the team. Success: Team with the highest score wins. Insider Information: One thing you’ll learn REALLY quickly. WATCH YOUR BACK AND FLANKS. People will figure out really quickly that while two teams are slugging it out, it’s real easy to drop in and blind side one team and then take off. Don’t hang around, get a couple of eliminations and get out of there.